"I've never tasted anything as good as the Butterfinger cheesecake in my life." I first began baking my cheesecakes in the 1980's as a special treat for our large family gatherings, and to give as one-of-a-kind gifts. They were so popular with my family and friends, I thought they would be a wonderful addition to the dessert menu for my restaurant, Liberty Station. The virtues of my cheesecakes have been extolled in newspapers and magazines up and down the East Coast. They have won several awards—most recently, the Best Dessert in the WSLS/News and Advance Celebrity Cookoff—by a unanimous vote! I use the best ingredients in my cheesecakes: heavy cream, real eggs, luscious cream cheese and tangy lemon juice. I wouldn't do it any other way. Our cheesecake flavors include Oreo, Blueberry, White Chocolate with Raspberry Swirl, White Chocolate with Strawberry Swirl, Chocolate Swirl, Key Lime, Pumpkin, Butterfinger, Amaretto, and Just Cheesecake. "This is how cheesecake is supposed to taste. Creamy, sweet, rich and out of this world!" Whenever you visit Old Liberty Station for lunch or dinner, consider a slice of cheesecake for dessert, or take home an entire cheesecake for later! 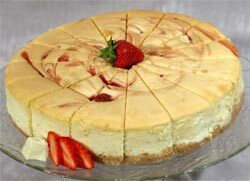 I invite you to try Harry’s Famous Cheesecakes for your personal enjoyment, for special occasions, or for memorable gifts. Your satisfaction is guaranteed. If you are not satisfied with your order, simply return the cheesecake for a full refund. When you try them and love them, share the good news with your friends.